Fox Business Channel has apologized for a recent broadcast of Lou Dobbs Tonight, in which a guest alleged that the migrant caravan was being funded by the “Soros-occupied State Department.” The comments drew little attention when they first aired on Thursday, but took on a tragic new light when they re-aired Saturday night, following the tragic shooting that took 11 lives in Pittsburgh earlier that day. 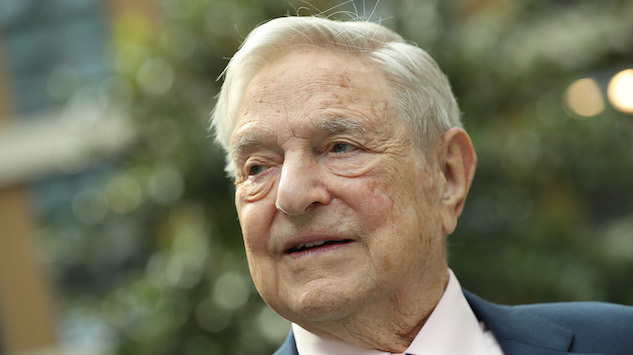 Soros, a Hungarian-American Holocaust survivor and billionaire philanthropist known to donate to progressive causes, has long been a target of such conspiracy theories. But the latest one—that Soros is funding the migrant caravan slowly headed to the U.S.-Mexico border—seems to have fueled right-wing rage that is now linked to tragedy. Robert Bowers, the alleged synagogue shooter, was reportedly active on far-right social media haven Gab, where he reposted comments describing the “third-world caravan” as a group of approaching “invaders” on his since-deactivated account, as well as reposting a number of anti-Semitic remarks. Cesar Sayoc, the Florida man who stands accused of mailing bombs to a number of high-profile left-wing figures last week, also appears to have a long paper trail of anti-Semitic posts on social media, and he also mentioned Soros dozens of times on his Twitter account before authorities say he mailed one of his bombs to the billionaire investor. The Soros-caravan conspiracy theory weaves together anti-Semitism, fear of immigrants and the specter of powerful foreign agents controlling major world events in pursuit of a hidden agenda. And it appears to have had real-world consequences on Saturday for Jews attending services, including a baby-naming ceremony, in their synagogue in Pittsburgh's Squirrel Hill neighborhood. While one would hope that such ideas would be relegated to the darkest corners of the Internet, some of the most powerful people in the country have chosen to amplify and mainstream these conspiracies, with conservative media proving all too willing to let them slide. On Oct. 17, Fla. Rep. Mark Gaetz shared a grainy video that purportedly shows Honduran immigrants being paid to join the U.S.-bound caravan (the video has since been debunked as having originated in Guatemala), and directly named Soros as a possible funder. Donald Trump Jr. liked the original Gaetz post on Twitter that same day, and the following morning, also liked a post in which conservative actor James Wood referenced the Soros caravan conspiracy. Later that day, his father President Trump reposted the original Gaetz video and also accused Democrats of letting the caravan into the country. The same day that President Trump reposted his video, Rep. Gaetz appeared on Fox Business’ program Kennedy, on which host Lisa Kennedy Montgomery asked Gaetz about the “pushback” to his original tweet, although she offered no such pushback when Gaetz failed to provide evidence for his accusations that Soros was funding Hondurans to enter the caravan. Now, it appears that this escalating rhetoric has unleashed tragedy in Pittsburgh and beyond, and it’s unclear whether there’s any clear way to stop the spread of such virulent conspiracies. Thankfully, earlier today, a step was taken in the right direction with the de-platforming of Gab, the far-right social media haven on which accused Squirrel Hill shooter Bowers reportedly festered some of his most virulently anti-Semitic views tied to the Soros caravan conspiracy. The right-wing infrastructure that allows such hateful conspiracies to run wild, though, still has a number of mouthpieces, leading all the way up to the highest office in the land.